View your course schedule Here. The Mariners Polytechnic Colleges Foundation (MPCF) this city, and the Bicol Chapter of Women in Maritime Philippines (WIMAPHIL) joined the International Maritime Organization (IMO) in the celebration of International Women’s Day on March 8 and 9, 2019 with activities held at the SM City of Legazpi. (Upper left picture) WIMA Philippines President Merle Jimenez-San Pedro addresses the audience at the opening rites of the International Women’s Day event at SM City Legazpi. (Lower Left picture) MPCF representatives led by Registrar Norma Villanueva (4th from right) and WIMA Bicol coordinator Ms. Lydia Cervantes (6th from left) pose for a souvenir photo with one of the forum speakers and representatives of SM City Legazpi. (Right picture) A representative of Banco de Oro gives a lecture on Financial Management before women and coeds. (Left picture) More action goes-on at the Women’s Day Celebration as the resource speaker hammers on ‘brick making’, an environment-friendly livelihood opportunity. (Right picture) One of the artworks of children from the group ‘Kurit Aki Bikol’, of Tabang Bikol Movement which was exhibited at the venue of the event. The event adopted the theme ‘Empowering Women in the Maritime Community’ for the commemoration of World Maritime Day for the year 2019. This provided an opportunity in raising awareness of the importance of gender equality, and it highlighted the important contribution of women all over the world to the maritime sector. Locally, WIMA-Bicol has adopted the theme ‘Kusog Kababaihan sa Pangataman kan Kapalibutan’ which is timely and relevant as it is centered on the role of women and their contributions towards caring of the environment & strengthening the community, advancing gender equality and empowerment of women. With MPCF-Legazpi President Merle Jimenez-San Pedro, who is also President of Women in Maritime – Philippines (WIMAPhil) and concurrent head of the Governing Council of Women in Maritime – Asia (WIMAsia), the local chapter has organized a two-day event which is the first regional activity to be held at the SM City mall in Legazpi City. The affair was organized by Mariners Polytechnic Colleges Foundation - Legazpi , Albay and Canaman, Camarines Sur in cooperation with Tabang Bikol Movement and partner government agencies promoting Gender & Development such as MARINA, PPA, BFAR, DENR, CHEd, DEPEd, DTI, DOLE, DA, DSWD, Philippine Coast Guard, Philippine National Police, Maritime Police, Commission on Human Rights, Legazpi Women’s Federation, Tabang Bikol Movement, “Kurit Aki”, and the City Government of Legazpi. City Mayor Noel Rosal graced the Opening Programme. Other partners include the Archipelago Philippine Ferries Corporation. Among the activities conducted include a parade around the city, talks on the rights and protection of women, reforms in maritime industry through legislation, financial management seminar, and mental health awareness. There were interactive help booths of government agencies, culinary and flair tending exhibition and the entertainment numbers presented as Tribute to Women and Mothers. These extravaganza show was rendered by MPCF students and by the school’s Band & Majorettes. As the International Women’s Day was celebrated, the fact remains that the maritime industry is dominated by men, which is why the term “seaman” is widely used to describe anyone working at sea. But since the United Nations (UN) started promoting gender equality, women have been taking part in industries that once belonged to men, the maritime industry included. In our country today, barely 1% belong to women who join the seafaring industry and are being encouraged to join it, seeing that they have the same potentials and skills as men. The International Maritime Organization believes that women are very important spring of human resources, which would make for safer sea travel . It would do well for the shipping industry to seriously consider this new wellspring of quality manpower and provide for more measures to protect them. “Considering the archipelagic nature of the Philippines and Bikol’s vulnerability to disasters, bringing both government and private sectors together during Women’s Day is a strategically significant move to consolidate women’s efforts in Bikol towards promoting and empowering women for community building and protection of the environment, ” emphasized WIMA President San Pedro. One of the highlights of the event was the eco brick making Seminar (#BawalAngPlastik), a project launched with Global Alliance and the LGU’s which contributed to the campaign for the protection of the environment. Davao City – The Philippine Association of Maritime Institutions (PAMI) held its 44th annual National Convention in Davao City in the third week of February 2019. Delegates from different maritime institutions from all over the country including Mariners Polytechnic Colleges Foundation (MPCF) in Legazpi City, Albay led by President Merle Jimenez-San Pedro attended the event. (Left picture) MPCF-Legazpi President Merle Jimenez-San Pedro addresses the assembly in her capacity as PAMI’s Secretary-General at the 44th annual National Convention held in Davao City. (Right picture) The delegates with the school’s VP for Academic Affairs Dr. Milagros Esparrago (3rd from right) as they listen to the message being conveyed. Some officers of the association while at dinner after the Board Meeting attended by its new members. In the picture with President Merle San Pedro are PAMI officers Chief Engineer Havoc , Atty. Pimentel and the members of Team MPCF-Legazpi. In the conference, President San Pedro, in her capacity as Member of the Board of Trustees and Secretary-General of the association was retained to the same posts after an election was conducted. Department of Transportation Secretary Arthur Tugade was represented by Undersecretary Paul Yebra who delivered the convention’s Keynote Address. Aside from the Mariners Legazpi delegates, colleagues from MPCF-Canaman, Camarines Sur also attended the event. The Philippine Association of Maritime Institutions (PAMI) is an organization composed mostly of schools from Higher Maritime Education Institutions (HMEI) which maintain a close watch on what goes-on in this sector of the maritime industry. It maintains a liaison with the Department of Transportation (DOTr), the Maritime Industry Authority (MARINA) and other concerned government agencies to safeguard the welfare and continuous development of this sector so it can serve its clientele well, especially in the field of maritime education. The Mariners Polytechnic Colleges Foundation (MPCF) in Legazpi City, Albay sent a delegation to the 2nd National Convention of the Government Academe Industry Network (GAIN), in a one-day forum which focused on the subject ‘The 4th Industrial Revolution: Preparing the Philippines for the Jobs of the Future’. Led by school President Madame Merle Jimenez-San Pedro, she was joined by VP for Academic Affairs Dr. Milagros Esparago and Office for Research and Extension Director Ms. Genevieve Marcelo-Sy. The gathering was held at the Dusit Thani Hotelin Makati, Metro Manila on February 8, 2019. MPCF-Legazpi sent school officials as representatives to the 2nd National Convention of the Government Academe Industry Network (GAIN). (Left to right) President Merle Jimenez-San Pedro, VP for Academic Affairs Dr. Milagros Esparago and Office of Research and Extension Services (ORES) Director Ms. Genevieve Marcelo-Sy. The convention participants take a break during the hectic forum schedule. With the MPCF-Legazpi delegates are colleagues from sister school, the Mariners Polytechnic Colleges Foundation in Canaman, Camarines Sur. Recognizing the key role of Filipino workers in achieving the priorities of the Philippine Government to accelerate human capital development, increase growth potential, and create an enabling and supportive economic environment, the Government-Academy-Industry Network (GAIN), in collaboration with stakeholders from the government, academe and industry, has organized the 2nd GAIN National Convention. The presence of MPCF school officials underscores the importance of doing observation on possible innovations which can be implemented in the academic activities of the institution so it can adequately prepare students in their formative years for jobs in the future. The fast pace in the advance in technology dictates a paradigm shift on how jobs should be handled in the coming years. The one-day conference also discussed in detail how the government, academe, and industry can work together in order to secure and strengthen our country’s global workforce. With Artificial Intelligence (AI) and technology continuously reshaping the world of business and education, the forum pushes for the country’s leaders to initiate proper steps to be able to stay current on the latest digital trends on Artificial Intelligence, Machine Learning, and most importantly, understanding how it can affect future jobs of Filipinos. Over 500 Representatives from Government, Academe, and Industry Sector participated in this event. Act as a partner in ensuring global competitiveness of our Philippine graduates and workforces by establishing international standards in English communication, technology, and subsequently across professional disciplines, such as Engineering, Hospitality, Accountancy, etc. RECOMMEND the creation of a unified national agency under the PQF-NCC as provided for in Republic Act 10968 to plan, implement and evaluate the Philippine Qualifications Framework. The participation of the members of the school delegation underscores the institution’s thrust to be competitive, attuned to the needs of the changing times and its conformity with global standard especially when it comes to sustaining quality education which the students need and deserve. The Mariners Polytechnic Colleges Foundation (MPCF) in Legazpi City, Albay organized a three-day Seamanship Enhancement Skills Training which centered onhull machinery maintenance training,focussing on Bosun’s Chair and Painter Stage Operations. This activity is in line with with the concept of Value Added Trainings (VAT) introduced to the institution by the school President Merle Jimenez-San Pedro. The participants in the three-day ‘Seamanship Enhancement Skills Training’ go to action doing actual work at the Landship in the school’s annex campus (with the Albay Gulf at the background). Aside from sharpening the on-the-job skills of the participants, safety measures while at work are given equal importance at the training which conform with the princiles of safety at sea. Some participants pose for posterity after the debriefing period on the last day of the activity with Trainer Capt. Josue P. Nuda (center in over-all white suit) and the school Registrar & MTI Director Ms. Norma Villanueva (in white shirt). (Right picture) Capt Nuyda conducts a lecture before the participants go to actual work. Attended by maritime instructors and cadets, this allowed them to further prepare themselves to sharpen their skills in the conduct of their mandated responsibilities as Seafarers. The training was held from February 16 to 18, 2019 at the MPCF-Legazpi Training Site, annex campus and was led by Capt. Josue P. Nuda as trainer. Aside from the enhancement of skills, among the topics given importance was the safety aspect in the workplace. This includes awareness of hazards in line with the principles of safety at sea such as wearing of protective gears while at work. “Activities of this kind will put our graduates in a higher level of employability and being competitive after they leave the portals of the school”, said President Merle Jimenez-San Pedro. In the spirit of corporate social responsibility, the members of the academic community of Mariners Polytechnic Colleges Foundation (MPCF) in Legazpi City, Albay led by President Merle Jimenez-San Pedro, the donors from Tabang Bicol Movement (TBM) and other groups have found significance in their involvement in the ‘Relief Drive for the Victims of TD Usman’. It was intended to help ease the condition of residents who were hardly battered by the storm. MPCF-Legazpi President Merle Jimenez-San Pedro conveys words of comfort and sympathy to the landslide victims of Tropical Depression Usman during the relief operation conducted in one of the barangays in the Tiwi area of the province of Albay where many lost their homes while some lost their loved-ones. At the background is one of the 21 landslide points in the vicinity where help is utmost needed. (Left picture) Student Affairs Services (SAS) Director Cynthia Duka, President Merle Jimenez-San Pedro (center picture) and volunteers help in the distribution of the relief items. (Right picture) The donated goods before they were shared to the residents. Upon seeing the miserable condition of the typhoon victims after the storm ravaged the Tiwi, Albay area, the Mariners school, aware of its corporate social responsibility did not lose time in making the move to encourage donors to send goods, using the school as the center of operation. Hundreds of residents lost their homes in the landslide-affected areas. The sad thing is lives were also lost at the height of the fury of the storm. In a way, the relief operation helped the residents as they struggled to return to their normal day-to-day living. The school has extended message of gratitude to those who, in one way or another have contributed in making this project a reality. Special thanks were conveyed to the donors, both from outside and inside the campus. To the personnel of MPCF, the relief operation was a touching experience because in their own little way, they felt they were able to share in making their effort become part of the solution in addressing the miserable condition of typhoon victims who at that time, needed most the goods shared by the donors. “Sheer determination propelled me as a struggling student to finish my Bachelor of Science in Marine Engineering (BSMarE) degree course at the Mariners Polytechnic Colleges Foundation (MPCF) in Legazpi City, Albay”. This was the statement made by Chief Engineer Ermel Abrigo (Batch 2008), in the school’s Thursday weekly radio-tv program ‘Buhay Marinero’ over Veritas Radio and Television. C/E Abrigo aboard a cargo ship he serves while on its way to a port in Los Angeles, California in the United States of America. For Engr. Abrigo, college life was far from being a bed of roses but it did not hamper him from pursuing his dream. As a featured guest at MPCF’s radio-tv program, he conveyed to the audience how his quest for an Engineering degree commenced and how he achieved his goal with flying colors. It all started when he took a qualifying examination so he could to take a Civil Engineering course in an institution (not MPCF), but did not qualify. Instead of allowing frustration to get the best of him, he accepted it as a challenge and tried the Mariners school in Legazpi City. This time, he eyed to be admitted in the College of Bachelor of Science in Marine Engineering (BSMarE) and he made it and this started the change in the track of his future. The next challenge he faced was how to sustain his needs while in school. Earlier on, his parents informed him frankly, they could not afford anymore to send him to college. With this reality, instead of going straight to tertiary education, he decided to quit school for one year and looked for a job. He worked and was able to save sufficient amount which eventually enabled him to enroll in the next academic year. With enough money for enrollment, the problem he had was how to sustain the financial requirements of his studies in the succeeding years. He lost no time in applying for a scholarship offered then by the government thru the Commission on Higher Education (CHEd). He got one and this helped him shoulder part of his school fees. Once in school, he looked for other opportunities inside the campus. He eyed to join the Coast Guard Auxiliary-Officer Training Corps (CGA-OTC) Cadet Officer Candidate School which granted discounted and full scholarship grants, depending on the rank attained. Determination, hard work and sheer luck catapulted him to become the Corps Commander and this gave him 100% free tuition fee benefit. This was a boost to his dream of becoming a ship officer, particularly to become a Chief Engineer and be able to work in an international sea-going vessel, someday. Time has flown so fast and success has caught-up with the former aspiring and struggling Maritime Engineering cadet. He is now a Chief Engineer in an international shipping firm, compensated in US dollars which makes him and his family comfortable and financially secured. The rest is history. At 26 years-old, he receives substantial earning as one of the highest officers serving in a sea vessel. With his stature in the maritime industry at a young age, he serves as an inspiration to students and especially to the would-be seafarers taking-up Maritime courses. He expressed gratitude to the administration, faculty and staff of the institution for helping and giving him the chance to develop his potentials which aided him to reach the status where he is today. At present, Engr. Abrigo is on-vacation from his job as ship officer and he temporarily heads the BS Marine Engineering Department of the school before he comes back to his mother ship to sail again in the seven seas. The Mariners Polytechnic Colleges Foundation (MPCF) in Legazpi City, Albay thru the Office of Research and Extension Services (ORES) and Student Affairs Services (SAS) and in the spirit of corporate social responsibility launched the ‘Relief Drive for the Victims of Tropical Depression Usman’. It was an effort to gather goodsthat answered some of the basic immediate needs of the calamity-stricken residents. The images of the landslides that occur in the barangays of Tiwi, Albay speak of the devastation brought by tropical depression Usman both to the poor and well-to-do families in the area. The occurrence prompted MPCF to launch the project. The storm hit the Bicol Region and it pounded the Albay-Camarines Sur areas with non-stop rains for four to five consecutive days in the last week of December 2018. This act of nature caused floods and landslides in these part of the two provinces. Casualties were reported particularly along the Tiwi,Albay-Sangay,Camarines Sur highway where twenty-one (21) landslides occurred causing damage not only to houses and properties but also to human lives. With this development, the MPCF administration did not lose time in launching an initiative to gather items which were needed outright by the affected residents. Most of them were unable to fend for themselves after they lost their houses, means of livelihood and worse, some lost their loved-ones who perished in the landslides that occurred. MPCF-Legazpi, in partnership with Tabang Bikol Movement (TBM) is grateful to those who shared their resources which helped lessen the suffering of the typhoon victims in the Tiwi, Albay area. In an effort to further strengthen and make more effective the Career Guidance missions steered by the institution, the Mariners Polytechnic Colleges Foundation (MPCF) in Legazpi City, Albay conducted a Basic Career Guidance Speakers’ Training and Seminar-Workshop for the members of the team organized to cater to this undertaking. (Left picture) MPCF-Legazpi President Merle Jimenez-San Pedro addresses the training participants as the audience (center picture) listens. (Right picture) Mariners System’s Corporate Public Affairs Officer Elmer Abad and MPCF’s Media Relations Officer Steven James Dino serve as seminar speakers and resource persons. At the helm of the training and seminar-workshop were the school’s Media Relations Officer (MRO) Steven James Dino and Mariners System’s Corporate Public Affairs Officer (CPAO) Elmer Abad, who both served as facilitators, training speakers and resource persons. CPAO Abad is an instructor in Radio-TV Broadcasting subjects at Mariners Polytechnic Colleges (MPC) – Naga’s Bachelor of Arts in Communication department and was former Station Manager of TV Channel 5 & DZOK Radio in Naga City. Select members of the academic community (mostly from the faculty and staff), endorsed by their respective department heads joined the activity. Those who were recommended and had attended the training are now part of the Speakers’ Bureau who will be tasked to conduct Career Guidance missions and give talks in scheduled out-of-town engagements. They will present to students in various High School institutions what the Mariners school is all about and what opportunities await them should they finish any of the courses offered by the institution. The activity was envisioned by MPCF-Legazpi President Merle Jimenez-San Pedro to equip those who will go out to conduct the undertaking, strengthen the system and create a template for the Career Guidance missions the school will embark on in the coming days. The participants consisted of five personnel from each department, recommended by their respective department heads. Basic inputs in effective public speaking, how to face media interviews (radio and television), observance of safety practices once out in the field and including the school administrative aspects which have to be complied with (before and after a mission) and coordination with the schools to be visited, were among the subjects taken-up. Aside from the presence of participants and the school President, the event was honored by the company of Vice President for Administration Conrad Cordero and VP for Academic Affairs Cynthia Duka, who delivered their respective messages. Other school officials who are exponents and contributors to the initiative also graced the occasion. The inputs in the training are expected to make the members of the team more prepared for the task that lies ahead so that they can become effective instruments in creating awareness among high school students on opportunities which can be availed of should they consider enrolling at Mariners Polytechnic Colleges Foundation. The Mariners Polytechnic Colleges Foundation (MPCF) in Legazpi City, Albay has come alive with the ‘Paskong Marinero’ atmosphere while the spirit of Christmas remains in the minds and hearts of the members of the academic community even after the holiday season. This sign on the wall at the school’s main campus says it all, heralding the Season’s spirit which members of the Mariners community savor as the yuletide celebration approaches. Groups from different departments prepare to present their rendition of Christmas carols, hoping to bag the honor and prizes at stake for the best performers at the ‘Paskong Marinero’ program. The Mariners Band play with gusto favorite Christmas music, establishing the Season’s air inside the campus. For the MPCF academic community, Paskong Marinero connotesa deeper meaning on how the event was celebrated. Itis all about the rejoicing on the true significance of Christmas which includes the essence of giving, unity and being grateful for all the blessings received. This spirit lingers-on in the hearts and minds of the members of the Mariners community even when the holiday season is over. The event recurrently reminds Marineros to come to the realization that amidst trials and challenges encountered, everyone must continue to work together and complement each other for a concerted search for solutions to the problems of the institution and individual concerns, as well. The Corp of Midshipmen, the governing body of students has organized activities that involved students from the different college departments, which made the celebration unique and colorful. After the 2018 yuletide season,the inspiration brought by Paskong Marinero goes on. This includes the message of spreading love, peace and unity inside and outside the campus. It is centered on God’s love to mankind. This is the reason why He sent His only begotten Son Jesus, and the reason why we celebrate Christmas! The Mariners Polytechnic Colleges Foundation (MPCF) in Legazpi City Albay steered an Institutional Planning forum which was attended by department heads and key school officials. The event was led by MPCF President Merle Jimenez-San Pedro who batted for dynamism in setting a common direction when it comes to the attainment of the school’s vision. (Left picture) MPCF-Legazpi President Merle Jimenez-San Pedro leads the Institutional Planning forum held at the main campus of the school. (Center picture) Vice President for Administration Conrad Cordero briefs the audience on the event’s details at the start of the gathering while the participants (right picture) listen. The event which was held from December 13 to 15, 2018 had for its theme ‘Unity in Vision, Innovation for Relevance’. The center of the confab is timely as workers in the academic community, particularly the department heads have to come-up with a united stand when it comes to how everyone should view and pursue the vision of the institution. The forum reviewed existing school programs and practices, identified those which need to be improved or changed while the participants came-up with suggestions on the possible course of actions which can be taken. “As one of the school’s personnel entrusted to handle essential role in the campus, I appreciate the importance of this gathering inasmuch as we have to move as one body with a common vision for Mariners. This endeavor spells our effort towards contributing to the relevance of the school and the education it offers to its clientele”, said NSTP Coordinator and Coast Guard Auxiliary – Officer Training Corps (CGA-OTC) Commandant Capt. Steven James Dino, PCGA, who is a member of the faculty at the same time. On the part of the school administration, it believes that a united view of the vision can trigger action towards implementing changes which can enhance the relevance of the institution and the education it offers to the students. A lot of coordinative effort among the personnel is needed for the institution to be able to attain this aspiration. The activity was initiated by MPCF-Legazpi President Merle Jimenez-San Pedro as part of the school’s continuing effort to be dynamic and attuned to the clamor for global standards when it comes to Business and Maritime education. Metro Manila – The Professional Regulation Commission (PRC) confirmed the names of twenty (20) graduates of Bachelor of Science In Customs Administration (BSCA) from Mariners Polytechnic Colleges Foundation (MPCF) in Legazpi City, Albay as among those who passed the 2018 Customs Brokers Licensure Examination (CBLE) given in November 2018. A 2018 graduate of Bachelor of Science in Customs Administration course, IVY TUGANO BERNARDINO captures the 8th Place slot of the 2018 Customs Brokers Licensure Examination given this November by the Professional Regulation Commission. Aside from Bernardino, there are board-passers from this institution who performed with flying colors. The Mariners community rejoices in this feat achieved by its graduates after this year’s examinees attained an institutional passing percentage higher than the national level. Of the total 2,478 takers, 1,266 made it to the passing level. The test was given by the members of the Board for Customs Brokers in Manila, Cebu and Davao. It can be recalled that in 2017, MPCF Alumna CYREL BIO GAYO got the 4th place slot in the Top Ten of the CBLE. “This feat attained by Ivy Bernardino and other CBLE passers speaks well of the concerted effort of the Mariners academic community and the legacy left by the school Founder, Commodore Jaime C. Jimenez, PCGA who started the quest for academic excellence in the institution”, declared MPCF-Legazpi President Madame Merle Jimenez San Pedro upon receipt of the examination result. The school administration has sent congratulatory message to Ms. Bernardino and the rest of the school alumni who passed the 2018 Customs Brokers Licensure Examination. The Mariners Polytechnic Colleges Foundation (MPCF) in Legazpi City, Albay once again teemed with students and activities as the second semester of academic year 2018-2019 opened on November 12, 2018. Enthusiasm and high expectations swarmed the campus as classes resumed. Hectic campus activities resume as students come back to the campus for the second semester. (Left picture) Maritime cadets rehearse at the Training Swimming Pool for their ‘Safety of Life at Sea’ lessons. (Right picture) Students take the qualifying examination for industry scholarship given by an international shipping company. The members of the Mariners community carried the spirit of fervor and firm resolve to sustain the quality education and academic excellence espoused then by the Institution’s late Founder Commodore Jaime C. Jimenez, PCGA. The first day of classes was made regular. This has been the tradition through the years. “All members of the academic community are aware of this strategy”, said Media Relations Officer James Diño. Prior to the school opening, the administration made the necessary preparations which have been the subject at the series of meetings conducted during the semestral break. As the late Founder constantly reminded all concerned during his time, he said, “Discipline starts with attendance in classes”. He was particular in the observance of basic discipline both for students and instructors which include punctuality and coming-up to attend classes prepared. He was also aware of what went on in the maritime world which made him push for the institution to innovate and adjust to global standards in education. “He believed that aside from the competence of faculty members, the school should be complemented with the latest facilities needed in the thorough training of future seafarers”, declared Maritime Studies instructor, Chief Mate Alvin Abalon. The business courses offered by the school have adjusted to the call of the times. “Global standards in the Hospitality Management courses offered by the school are continually upgraded to meet the demands of international firms where our students go to work after graduation”, Media Relations Officer James Diño further said. The spirit of Commodore Jaime C. Jimenez lives on and is still felt by the Mariners academic community as another semester is ushered-in for academic year 2018-2019. The Mariners Polytechnic Colleges Foundation (MPCF) this province, implemented a novelty strategy by setting a promotion static display at the Ayala Mall in its second semester enrollment campaign for academic year 2018-2019. The MPCF enrollment ‘promotion static display’ inside the Ayala Mall boosts the school’s campaign effort by fielding maritime cadets who manned the corner during office hours. It affords shoppers to avail of brochures and get answers to basic questions about the school and the courses offered. People are encouraged to visit the campus for the details of the answers to the inquiries parents and students pose. Included in the display is a standee which enumerates the school’s academic offerings that include the flagship courses Bachelor of Science in Marine Transportation (BSMT) and Bachelor of Science in Marine Engineering (BSMarE). Other courses offered such as the 5-year BS in Mechanical Engineering (BSME), the four-year course BS in Customs Administration (BSCA) and the four-year BS in Hospitality Management, were highlighted. It also presented the school’s Senior High School academic program plus the services of trhe Maritime Training Institute (MTI) which conducts the Basic Training package to aspiring Seafarers who wish to be issued with Seaman’s Books so they can work in various sea-vessels and in different capacities. This enrollment campaign innovation was done to widen the avenues in the spread of basic information about the Mariners school in addition to the conventional enrollment approaches which the school has traditionally implemented. MANILA, September 27, 2018 – Maritime industry stakeholders commended President Rodrigo Duterte for living up to his election promise to make national maritime agenda a priority of his administration. Merle Jimenez-San Pedro, one of the convenors of the Movement for Maritime Philippines (MMP), said Duterte’s issuance of Proclamation 316 declaring September as Maritime and Archipelagic Nation Awareness Month (MANA Mo) is a big step to boost the role of the maritime industry in the country’s economic development. “It has really been a long, long struggle for the stakeholders that we get (the) much-needed attention of government,” San Pedro said in a media briefing at the Philippine International Convention Center on Wednesday. While they see MANA Mo as a way to boost maritime awareness, San Pedro said both government and private sectors must work harder to make sure that policies, programs and activities would cascade down to the regional level. “We realized for so many years that stakeholders have been pushing for a lot more reforms for the maritime. This is going to take more years maybe but we are happy that the first step has been done with the declaration of September as MANA Mo,” San Pedro said. “This is just the beginning and I think the stakeholders will not stop in giving support because we still have a lot of work to do, especially in the community just to cascade this call for MANA Mo and to strengthen really our resolve for a better maritime Philippines,” she added. She emphasized the need for the government to shift the people's attention not only on land-based, but marine-based development, considering that the Philippines is a maritime and archipelagic nation. San Pedro said Duterte, then Davao City mayor, was the only presidential candidate who responded to the MMP’s invitation to present their respective agenda for maritime industry during the 2016 election campaign. “It was only Mayor Duterte who came and he promised that if and when he wins, he will make national maritime agenda as his priority. So that from time on, we have been working closely with different government agencies,” San Pedro said in an interview with the Philippine News Agency (PNA). She expressed gratitude to the National Coast Watch Council (NCWC) for noting the stakeholders’ efforts to give significant contribution to national economic development. San Pedro has commended the NCWC Secretary for organizing a National Marine Summit, which will be held tentatively in January next year. She said all stakeholders from the private sector are looking forward to participate in the summit where Duterte is expected to issue an executive order (EO) towards attaining the marine development agenda. Eric Marquez of the Joint Manning Group, on the other hand, expressed hope that the National Marine Summit would sustain the country’s position as the world’s top producer of competent seafarers. “I’m happy that the direction of the NCWC is something that is noble, unique and for the first time, we are hearing (the) government talking a lot of sense,” Marquez said. “Now I see a glimmer of hope and I hope these efforts that we are doing will really come out as one that will help the industry, all the sectors, not only manning. What we really need in manning is to keep our position as premier supplier of seamen,” he added. According to the Maritime Industry Authority (MARINA), 695,742 Filipino seafarers sent USD5.578 billion in total remittances in 2016. Meanwhile, Meneleo Carlos III of the Shipyard Association of the Philippines (SHAP) thanked the NCWC for consulting their sector on the government’s efforts to give their industry a bigger role in economic development. “We feel that the shipyard industry has a large role to play in all of those areas and while (it) may not operate the ships necessarily, we are to maintain the vessels and we are here to help the country benefit from properly maintained and managed maritime resources,” Carlos said. In the upcoming National Marine Summit, the NCWCS expressed hope that Duterte would promulgate an updated National Marine Policy (NMP). Michael Eric Castillo of NCWC Secretariat, meanwhile, said the NMP was formulated in 1994 but has not been fully implemented and adopted to consider social, political, economic and technological changes and advancements of marine development. Castillo said the 24-year-old document must be updated to make it attuned to the present national economic development agenda. He said all stakeholders from the government and private sectors will be given a chance to share their inputs in a convergence conference on Oct. 29-30 this year. The Mariners Polytechnic Colleges Foundation (MPCF) in Legazpi City, Albay joined the international maritime community in observing Maritime Week. Various activities were conducted in the school in the week-long celebration from September 24-29, 2018. MPCF Maritime cadets and school officials led by CGA-OTC Commandant Captain James Dino, PCGA (right picture with microphone) and the representatives from the Philippine Coast Guard (PCG)-Bicol as they do the honoring for the ‘Fallen Seafarers’ at the beachfront of the school annex campus. (Left picture) The CGA-OTC cadets at the parade formation in celebration of Maritime Week. (Right picture) Industry partners participate during the Color FunRun. The Maritime Industry Authority (MARINA), the Philippine Coast Guard (PCG), and the Philippine Coast Guard Auxiliary (PCGA) in the Bicol Region have fused their efforts, together with the Mariners school for this commemorative activity. The event theme is ‘Marinong Pilipino, Kayamanan ng Lahi’ (Pilipino Seafarers, Wealth of the Philippine Race). This is appropriate more so that it gives importance to the role Seafarers play and their contribution to the progress and the economic well-being of the country and its people. The celebration also touched on the significance of the unique geographical set-up we have in which our nation is an archipelago. “The Philippines being composed of islands has made the shipping industry do the role of connecting the compact groups into one nation. This is one reason why we celebrate maritime. The commemoration acknowledges the fact which is inherent in the nature of the character of our country which is surrounded by sea”, said CGA-OTC Commandant Captain James Dino. Every year, National Maritime Week is observed during the last week of September, pursuant to Presidential Proclamation 1094 issued in 1997 by then President Fidel V. Ramos. The celebration is in consonance with the International Maritime Organization (IMO) program declaring the last Thursday of September as World Maritime Day. This year, the school has embarked on activities which include the ‘Coastal Clean-up’ and the series of symposia participated by students on topics with bearing on the protection of the environment. For Filipinos, shipping is more than just a means of transportation. It is a way of living that enables mobility of goods and people, provides livelihood and generates jobs, allows the enjoyment of economic gains realized from maritime activities and in some ways, it serves as the basic means of survival for many. MPCF-Legazpi as a Higher Maritime Education Institution (HMEI) partakes in the celebration to highlight the relevance of the Seafaring profession in the Maritime world especially in creating awareness among people so they can rally behind in supporting the Marineros who serve the country and the world in this particular field in their own unique way. Naga City- The contingent of Mariners Polytechnic Colleges Foundation (MPCF) of Legazpi City, Albay which was sent to compete in the 2018 Regional Military Parade Competition has won several of the sought-after awards at stake during the Penafrancia Fiesta held in the streets of Naga City on September 14, 2018. The event is one of the biggest and most colorful traditional activities conducted to honor the Patroness of Bicolandia in the annual celebration of the regional festival. The 901st Coast Guard Auxiliary-Officer Training Corps (CGA-OTC) cadets together with the Band & Majorettes of MPCF-Legazpi display their gallant fighting form as they brave the heavy rain during the Regional Military Parade Competition at the 2018 Penafrancia Festival. The CGA-OTC and Band & Majorettes mentors together with the cadet officers who saw action in the military parade contest display the trophy, citation and medals won in the competition immediately after the event. Just like in the previous years, the MPCF-Legazpi Band and Majorettes show their winning potential during the parade held in the streets of Naga City at the height of the Penafrancia Festival celebration. The heavy downpour brought by super typhoon ‘Ompong’ which ravaged the extreme Northern Luzon area of the country at the time of the parade did not dampen the enthusiasm of the Band and Majorettes members and so with the marching units of the Coast Guard Auxiliary-Officer Training Corps (CGA-OTC). With numerous competitors coming from different prestigious schools all over the Bicol Region, the titles won by MPCF are additional proud ‘feathers in the cap’ for the Mariners institution. Among the awards received by the school include the following: First Place, in the Best Marching Bandand Second place in the Best Marching Majorettes categories at the group B level. It also captured the Fourth Place prize in the Most Disciplined ROTC Unit class. Included in the factors cited by CGA-OTC Commandant Capt. James Dino, PCGA in the winnings received are the discipline and determination of the contest participants from the school. In behalf of the administration, MPCF-Legazpi President Madame Merle Jimenez San Pedro has sent congratulatory message to the units and lauded the group for what they have achieved. The Mariners Polytechnic Colleges Foundation (MPCF) this province, is all set for the celebration of its 33rd Foundation Anniversary on August 4, 2018. Included in the center of the event are features on the school’s humble beginning, the transformation to what it is now, and what has been mapped-out to be achieved in the years to come. The academic community of Mariners Polytechnic Colleges Foundation salutes its Founder, Commodore Jaime Chavez Jimenez, Sr. on the occasion of the school’s 33rd Foundation Anniversary. (Left picture) Madame Merle Jimenez-San Pedro leads the stewardship of MPCF-Legazpi in charting the course it will take in the coming years as the school’s 4th President. (Right picture) The students as they prepare to add color to the celebration thru similar presentations. It has always been the passion of the men and women of the Mariners academic community to pursue the tradition of excellence in serving the Bicolano youth through quality education which is continually inspired by the spirit of the Founder, Commodore Jaime C. Jimenez, Sr. who fought to surmount the challenges faced by the institution in its fledgling years. MPCF –Legazpi has gone a long way since its inception in 1985. Notable among its achievement is the school’s inclusion in the roster of top Higher Maritime Education Institutions (HMEI) in the country as per evaluation made by the Commission on Higher Education (CHEd), the Maritime Industry Authority (MARINA), and the distinction given by the European Maritime Safety Agency (EMSA) in 2015. The result of this evaluation qualified Mariners’ (together with its sister school- the Mariners Polytechnic Colleges Foundation in Canaman, Camarines Sur) into maritime officers’ institutions whose baccalaureate degree courses offered in BS Maritime Transportation (BSMT) and BS Marine Engineering (BSMarE) were duly recognized by CHEd, MARINA and EMSA. In compliance with the new educational system in the country, the flourishing Senior High School Department, offering different academic strands was established in 2015. An annex campus facing the Albay Gulf, a walking distance from the main campus was opened where important facilities can be found such as the Training Swimming Pool used by maritime cadets, the Land Ship with the fully-enclosed life boat, maritime laboratories, the JCJ Gymnasium, the mock hotel used in the training of Hospitality Management students and the amenities for the Mariners Training Institute (MTI). The Senior High School building is likewise situated in this area. The school prides itself with what the alumni have accomplished. A high percentage of passers in examinations given by the Professional Regulation Commission (PRC) has been registered all throughout the years, with some graduates landing in the list of Board Topnotchers. 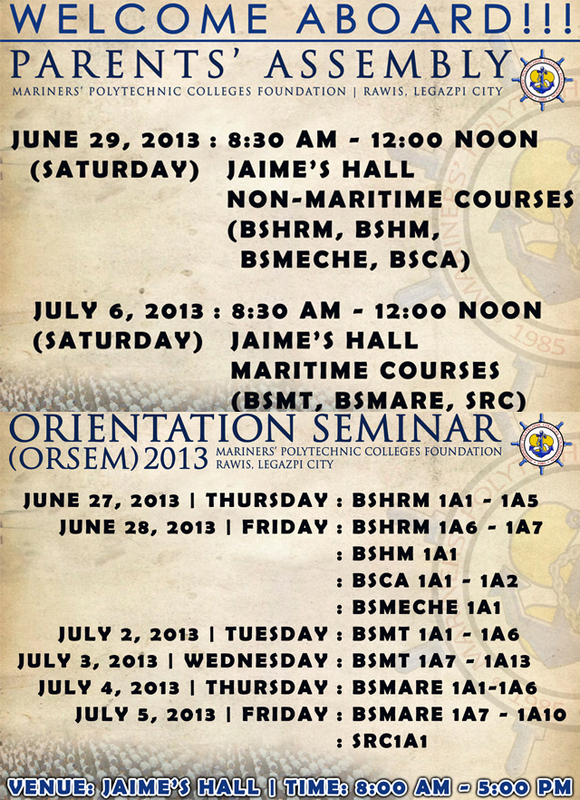 MPCF stands with distinction with its Maritime degree- offerings (BSMT& BSMarE) plus the BS Mechanical Engineering (BSME) program and the business courses which include Bachelor of Science in Customs Administration (BSCA), and the Hospitality Management (HM) curriculum & allied fields of studies. 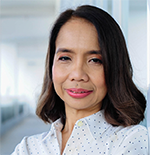 Many graduates now work in firms in the Philippines and abroad while some have opted to become entrepreneurs by putting-up their own businesses. The students, faculty, staff and administration of Mariners Polytechnic Colleges Foundation are one in their spirit of optimism, that with the aid of Divine Providence, the school will continue to fly high with its determination to achieve the goals the school has set. The Mariners Polytechnic Colleges Foundation (MPCF) this province, joined the celebration of the International Day of the Seafarer with activities participated by maritime cadets, students and the academic community to honor the men and women in the maritime industry. Students gather at the Mariners Polytechnic Colleges Foundation’s JCJ Gymnasium to listen to the lecture by the officers of the Philippine Coast Guard (PCG) on the protection of marine environment as part of the celebration of the International Day of the Seafarer. (Right picture) MPCF students prepare to join the Coastal Clean-up drive at the MPCF-Legazpi annex campus facing the Albay Gulf. (Right picture) A group of maritime cadets stay in formation as they await instructions for the day’s activities. Instead of June 25, the school held the activity two days in advance on June 23 in anticipation of the transport strike in the city which was staged by its organizers on June 25, 2018. As a backgrounder, in 2010 the International Maritime Organization (IMO) decided to designate June 25 as the International Day of the Seafarer as a way to recognize that almost everything that people use in our daily lives has been directly or indirectly affected by sea transport. According to IMO's estimates, ships transport almost 90 percent of the world’s goods trade. Seafarers are not only responsible for the operations of such ships, but are also responsible for the safe and smooth delivery of the cargo. The day not only acknowledges the invaluable work of seafarers, but also aims to bring global attention to the issues affecting their work and lives, such as piracy. It calls on governments to develop policies that lead to fair treatment of seafarers at ports, and asks private ship companies and owners to provide their employees proper facilities and comforts while they are at sea. With thousands of Filipinos and many graduates of the Mariners schools in Bicol working in the Maritime industry worldwide nowadays, the school has traditionally joined the annual commemoration of the International Day of the Seafarer. The Mariners Polytechnic Colleges Foundation (MPCF) this province, has formally opened Academic Year 2018-2019 with high optimism on the part of students, faculty, staff and administration that everything will go on as planned after all preparations were put in place to assure the smooth opening of classes. (Top picture) Maritime cadets and business students with faculty, staff and school officials join the morning colors on June 18, 2018 to formally open the AY 2018-2019. (Bottom pictures) Cadets are rendering hand salute and pledge of undertaking during the flag ceremony. With Maritime courses and other academic programs in the forefront, the school has made it a point to make all preparation efforts at its highest level to make the first day of classes regular for all concerned. As prescribed by the Department of Education (DepEd), classes in the Senior High School rolled on June 4 while in the College level, it started on June 18, 2018. “With all items in our checklist having been adhered to when it comes to preparing the institution for the opening of classes, we remain optimistic that the plans will materialize as once again, the school aims at giving what is best for the institution and the academic community, especially the students”, said Vice President for Administration Conrad Cordero. The Maritime degree offerings in BS Marine Transportation (BSMT) and Marine Engineering (BSMarE) remain the forerunners together with the business programs which include the Hospitality Management and allied fields plus the Bachelor of Science in Customs Administration (BSCA) course. “We expect this school year to be vibrant and innovative while this institution continues to adhere to the direction laid by the Commission on Higher Education (CHEd), the Maritime Industry Authority (MARINA) and the Department of Education for the Senior High School”, declared MPCF-Legazpi President Madame Merle Jimenez-San Pedro. School Registrar Norma Villanueva has confirmed the significant increase in the number of enrollees in almost all departments for the first semester of academic year 2018-2019. San Vicente, Libmanan, Camarines Sur – Representatives from the academic community of Mariners System (Mariners Polytechnic Colleges Foundation – Legazpi City, Albay & Canaman, Camarines Sur and Mariners Polytechnic Colleges –Naga City) paid a homage to the hometown of the schools’ Founder, Commodore Jaime C. Jimenez Sr. PCGA on the occasion of his 96th birth anniversary on April 30, 2018. It was led by the members of the Board of Trustees of the Mariners institutions in Bicol. (Left picture) a painting of the Founder - Commodore Jaime C. Jimenez, Sr. with Co-Founder Madame Eliza Lazaro-Jimenez in their younger years. (Right picture) The Mariners Band and Majorettes perform on the streets of Bgy. San Vicente which add color to the festive mood during the occasion. At the background is Libmanan’s San Vicente Parish Church. (Left picture) San Vicente Parish Priest Father Rene Francisco (3rd from left) meets the members of the Board of Trustees on the details of the multi-purpose building donation of Mariners System to the local church. L to R- MPCF Legazpi President Merle Jimenez San Pedro, BOT Member Evita Lazaro Jimenez, Fr. Francisco, MPC-Naga EVP Dr. Gabriel L. Jimenez, Commodore Dante La. Jimenez, PCGA and MPCF-Camarines Sur and MPC-Naga President Dr. Marilissa Jimenez-Ampuan. (Right picture) School officials join the lunchtime ‘Boodle Fight’ that ensued after the short program and the celebration of the Holy Mass. (Left picture) The barangay folks of San Vicente together with the officials of Mariners System attend the Thanksgiving Mass commemorating the birth anniversary of Commodore Jaime C. Jimenez. (Right picture) The Board of Trustees Members and some school officials pose for a souvenir photo. Barangay San Vicente in Libmanan town is acknowledged as the home-village of the late Founder where his parents nurtured him from childhood to manhood days. It was there where he was born and grew-up in which the seed of ideas that preoccupied his mind turned-out later to bear the founding of the Mariners schools in Bicol. It was an occasion which remembered the history and legacy left by Commodore Jimenez. There was a short program in which the members of the Board of Trustees gave their respective short messages to the people of Bgy. San Vicente and to the Mariners communty. One of the highlights of the event was the unveiling to the plan of a multi-purpose building which the institution will donate to the barangay folks and to the San Vicente Parish Church. The occasion was one unique event in honoring the Founder of Mariners System on the occasion of his birth anniversary. The Mariners Polytechnic Colleges Foundation (MPCF) this province, held its 32nd Commencement Exercises and Ring Hop Ceremonies at the JCJ Gymnasium, in the annex campus of the school. The event on April 10, 2018 was honored by the President of the Japanese shipping firm Misuga Management Services in the Philippines, Mr. Akihiro Kashiwagi as Guest Speaker. (Left picture) The Commencement Speaker, President Akihiro Kashiwagi of Misuga Management services, Inc. (Right picture) The school officials and other guests while on the stage during the graduation rites. (Left picture) The graduating batch as they listen to the message of MPCF-Legazpi President Madame Merle Jimenez San Pedro. (Right picture) The school officials and guests. (1st Row, right to left) Special Guest Secretary Dante La. Jimenez, Chairman of the Presidential Anti-Corruption Commission (PACC), the Guest Speaker Mr.Kashiwagi, Board of Trustees Secretary Madame Nimfa Valdez Jimenez, VP for Administration Mr. Conrado Cordero and VP for Academic Affairs Madame Cynthia Duka. A seasoned seafaring executive, Mr. Kashiwagi is a graduate of Maritime Navigation Course in 1977 from the Maritime College of Hiroshima in Japan. He has handled various positions in different Japanese shipping firms. In 2017, he joined Misuga Kauin Co. Ltd. as General Manager & President of Misuga Management Services Inc. In his message, he emphasized the need for the graduates to excel in their chosen profession. “In the maritime industry in which competition is a gauge on how the players perform in their respective fields of assignments, those who excel are noticed and are given reward as the fruit of their labor. Excellence also enhances the level of safety at sea”, said Mr. Kashiwagi. Aside from those who finished the academic requirements in the BS Marine Transportation, BS Marine Engineering and BS in Mechanical Engineering programs, other students graduated after having finished the business courses they have taken in Bachelor of Science in Customs Administration (BSCA), Bachelor of Science in Hospitality Management (BSHM) and the Bachelor of Science in Hotel and Restaurant Management (BSHRM). Representatives from other shipping firms, which are the school’s industry partners came and joined the event. “As you leave the portals of this institution, continue to carry what the school has nurtured in you. The mission and vision of the late Founder Commodore Jaime Jimenez for the school and its graduates and the values he cherished in his dream for professional Seafarers should become part of everyone”, declared President Madame Merle Jimenez San Pedro in her address at the commencement rites at the Mariners Polytechnic Colleges Foundation in Legazpi City. Legazpi City, Albay - The Board of Trustees of Mariners Polytechnic Colleges Foundation (MPCF) this province has formally steered the changing-of-the-guard from the incumbent to the new President/Chief Executive Officer of the institution in simple ceremonies held at the Jaime’s Hall of the school’s annex campus on March 1, 2018. The outgoing and incoming Presidents/CEO’s of MPCF-Legazpi. (Left picture) Commodore Dante La. Jimenez delivers a message after the Thanksgiving Mass. (Right picture) Incoming President Merle Jimenez San Pedro accepts the stewardship of the school as CHEd Bicol Regional Director George Colorado and outgoing CEO Jimenez listen. (Left picture) The incoming and outgoing school heads at the Thanksgiving Mass Offertory with the Mass presiders. (Right picture) The academic community and invited guests attend the religious activity as one of the highlights of the Turn-Over Ceremonies. From the leadership of Commodore Dante La. Jimenez, PCGA, it was formally handed to Madame Merle Jimenez San Pedro who was Executive Vice President prior to her assumption of the college’s top post. Included in the event was the accomplishment report of the outgoing President which showed the amazing transformation of the institution in the sixteen-year stint which he handled the Presidency. The once ‘taken-for-granted’ maritime school in Bicol is now one of the top-performing Higher Maritime Education Institutions (HMEIs) in the country today. No less than the Commission on Higher Education (CHEd), The Maritime Industry Authority (MARINA) and the European Maritime Safety Agency (EMSA) have granted accreditation acknowledging MPCF-Legazpi as one of the country’s best players when it comes to giving maritime education. The occasion was attended by CHEd Bicol Regional Director George Colorado, the Members of the Board of Trustees led by MPCF-Legazpi Chairman Dr. Gabriel Lazaro Jimenez, Officials from the Mariners sister institutions in Naga City & Canaman, Camarines Sur, Legazpi City Mayor Noel Rosal, the members of the academic community and friends. It was started with a Thanksgiving Mass held at the JCJ Gymnasium and followed by the simple Turn-Over Rites at the Jaime’s Hall. In his message as outgoing officer, Commodore Jimenez challenged the academic community to continue the best practices which catapulted the establishment to what it is now. “It cannot be denied that a lot of good things have happened since its inception, 33 years ago”, declared the outgoing President. On the other hand, the incoming CEO hinted on the best things to come at Mariners. “Although what the outgoing President has done is a hard act to follow, I trust the tested and proven abilities and capabilities of the present crop of officers and department heads to continue sustaining what has been started. With the intervention of ‘Divine Guidance’ altogether we can achieve the goals we have set for the coming years”, said newly installed MPCF-Legazpi’s President and Chief Executive Officer Madame Merle San Pedro. The movement in the institution’s leadership was triggered by the appointment of Commodore Jimenez as Chairman of the Presidential Anti Corruption Commission (PACC), a cabinet agency created thru an Executive order by the administration of President Rodrigo Duterte. The students, officers, members of the faculty & staff have pledged their unwavering support to the new leadership as a new era starts in the campus of Mariners Polytechnic Colleges Foundation in Legazpi City, Albay. Legazpi City, Albay – Cadets of Mariners Polytechnic Colleges Foundation (MPCF) this province, who just returned home after their one year apprenticeship shared their experiences and adventures to media audiences after they were featured in the school’s ‘Buhay Marinero’ program aired over Radio Veritas and Veritas TV. (Left picture) The returning maritime cadets of MPCF-Legazpi while at the radio-tv studios as guests. They share their experiences and adventures aboard international sea-going vessels plying the seven seas of the world. They are featured in the school’s Thursday weekly show ‘Buhay Marinero’ over Radio Veritas and Veritas TV. (L to R) Ryan Dexter Bon, Mark Joseph Barnedo, Enrique Claudio Bio, Christopher Bonina, John Kevin Camu and Aldrin Calingasyon, and together with one of the Program Anchors of the show, Capt. Steven James Diño (extreme left), who is the school’s Media Relations Officer. (Right picture) A typical container ship where graduates have their apprenticeship after the 3-year training program and academic studies at MPCF. During the interview, the cadets expressed their excitement on having boarded international sea-going vessels after graduation. After almost a year at sea, they pride themselves of having entered the next level of their profession as Seafarers. Most of them admitted that the first two months at sea was indeed a period of adjustment. Included in the challenges they faced was ‘homesickness’, with them having gone away from home that long for the first time. There was also the ‘seasickness’ syndrome which a newcomer in the profession usually encounters. These factors plus the adjustments which had to be made in dealing with ship officer-superiors and colleagues who come from different countries and of varied nationalities and cultures, these they had to contend with. There was also the ‘language’ barrier with most of the crew members come from Europe, India, South America and Asia. They found-out that Filipinos have the advantage when it comes to the use of English as medium of communication. One of the experiences they treasure was the opportunity of having been to countries and key cities of the world in continents they never imagined before, they would be able to set foot on them. After having circumnavigated the world via the seven seas and after having experienced to be compensated in US dollars, they have vowed to continue to work in the maritime industry which they have started. After their three-month vacation, they will go back to their respective shipping companies to resume work. The option to further undergo training and upgrade their status as ship officers lurk as they wish to be promoted to the next higher rank, the soonest possible time. All of them have expressed gratitude to their alma mater as they claim that had it not been for the education they got from the Mariners school, they would not be in the position where they are today. An alumna of the Mariners Polytechnic Colleges Foundation (MPCF) this province, has landed with prominence in the TOP 10 slot of the recently-concluded Customs Brokers Licensure Examination (CBLE) given by the Professional Regulation Commission (PRC) on November 22 and 23, 2017. CYREL BIO GAYO, a Bachelor of Science in Customs Administration (BSCA) graduate (batch 2017), captured the 4th place out of 2,093 examinees. Aside from Ms. Gayo, eighteen others made it. A Brokers’ Toast has been scheduled by the academic community as recognition and to celebrate the feat achieved by the Customs Brokers Licensure Examination passers. “The Board of Trustees and administration of Mariners Polytechnic Colleges Foundation (MPCF) Legazpi City congratulate Cyrel Bio Gayo, the eighteen other board passers and their parents for this achievement reached by our BS Customs Administration graduates”, declared President/CEO Commodore Dante La. Jimenez upon receiving the news of the board examination result. Legazpi City, Albay – Executives from the Magsaysay Institute of Shipping (MIS) visited Mariners Polytechnic Colleges Foundation (MPCF) this province on November 15 and 16, 2017 to conduct qualifying examination to maritime cadets for possible granting of scholarship and deployment in its legion of sea vessels plying the seven seas of the world, once they graduate. (Left picture) President/CEO Dante La. Jimenez entertains the visiting executives of Magsaysay Institute of Shipping at the Eliza Hall while maritime cadets (right picture) take the qualifying examination. Included in the entourage of the visitingexecutives were MIS Director and Interviewer Mr. Alex M. Enriquez, Prefect of Studies Mr. Charles P. Go, Scholarship Officer Ms. Cheryl A. Gabarda and Fleet Director/Magsaysay Maritime Interviewer Chief Engineer Cielito Mamawag. It can be recalled that since the school was granted accreditation to offer Baccalaureate Degree courses in Bachelor of Science in Marine Transportation (BSMT) and Bachelor of Science in Marine Engineering (BSMarE) by the Maritime Industry Authority (MARINA), Commission on Higher Education (CHEd) and the European Maritime Safety Agency (EMSA), representatives from international shipping companies came to the school to entice Midshipmen to join the ranks of their respective firms. “This gesture of our Industry Partners to come to the school is very encouraging on the part of the school administration inasmuch as this will open opportunities to deserving students from marginalized families who wish to study and become ship officers” said President/CEO Dante Jimenez. On the academic side, the administration puts emphasis on sustaining the implementation of the quality standards set by MARINA, CHEd and EMSA. “There is no other way but to implement the tenets set forth by these agencies as this will spell the kind of Seafarer-Officers we will have. Foremost in our goal is to have our students imbibe the principle of safety at sea which can only be achieved via thorough learning and training while they are in college”, declared Vice President for Academic Affairs Cynthia Duka. The MPCF-Legazpi Family as it welcomes aboard the visiting Industry Partner-representatives from the Magsaysay Institute of Shipping. The principle of Safety at Sea which the Mariners System strictly adheres to as its guiding light in giving education to future Seafarers was construed from the statement made by the Founder of Mariners System who put emphasis on the seaman’s knowledge in sailing safely a sea vessel, when the late Commodore Jaime C. Jimenez once said “I am not afraid of the storm for I know how to sail my ship”. Legazpi City, Albay – The academic community of Mariners Polytechnic Colleges Foundation (MPCF) this province, has primed for the start of the second semester of academic year 2017-2018. MPCF-Legazpi President/CEO Commodore Dante La. Jimenez (extreme right) in a jolly chat with some members of the Management Committee to gear-up for the start of the second semester to assure the smooth opening of classes. In the picture are (left to right) HR Director Julie Ann Nieva, ORES Director Genevieve Marcelo-Sy, VP for Administration Conrad Cordero, VP for Academics Cynthia Duka, Media Relations Officer and CGA-OTC Commandant Captain James Diño, and Dean of Maritime Studies C/M Alvin F. Abalon (partly hidden) and the CEO. The facilities at the main as well as at the annex campuses are being refurbished to prepare them for the start of the second semester classes. Aside from making the facilities of the school ready for the opening of classes, the administration has reiterated the preparedness which the minds and hearts of the members of the academic community should have. “Let us have a concerted effort again in making the delivery of service to the students as smooth and effective as can be, as what we have traditionally done in the past years. We have to sustain this quality of service to our clientele – the students, who deserve the best from us”, said President Dante Jimenez. On the part of the students and parents, the school leadership has encouraged them to make the first day of classes as regular and normal as can be. “Gone are the days when the first day of class is taken for granted while some students would opt to come several days or a week after the official opening of the semester. The school is encouraging everyone, especially on having responsible students and school personnel”, VP for Administration Conrad Cordero declared. Senior High School classes start on November 6 while in the College level, November 8, 2017 has been the target date. With a clear marching order from the school management, the Mariners Academic Community has vowed to sustain on having the customary ‘right start’ for the second semester of Academic Year 2017-2018. A loving mother, called Mommy Dear by her surviving children and grandchildren, Eliza left behind numerous relatives and friends including those with whom she shared much of her generosity and compassion and who will miss her greatly. The family wishes to thank all of those who cared and prayed for her during the last few months of her illness at a City hospital and who shared their loss when she finally joined the Lord. Prayers and donations for her charity which touched the lives of many like schooling for poor aspirants to the Priesthood and for the Chapel for Seafarers at Mariners are most welcome and may be made to any of the schools through the Office of Finance Affairs (OFA). With love, the memory of her kind deeds and the strength of her good example live on. Dios Mabalos! Thank you very much! The Mariners Polytechnic Colleges Foundation (MPCF) this city has staged the colorful Intramurals 2017, the annual break from academic activities given to students which allowed them to focus and participate in various sporting activities and contests held at the main and annex school campuses from September 26 to 29, 2017. The training swimming pool at the MPCF-Legazpi annex campus becomes alive with colorful flaglets and the presence of spectators and competing swimming teams which vie for the coveted honors for the winners. Up-close: Participants in the swimming competition push hard to reach the finish line. This event is among the most attended and exciting contests in the Intramurals 2017. A glimpse of more action at the Intramurals 2017: Note how the players perform with enthusiasm and determination. Aside from the physical activities brought about by participating in the games, the students were exposed to the deeper meaning of the event such as the honing of skills in which talents were discovered while the spirit of sportsmanship among the partakers was developed. “The theme ‘Upholding Marinero’s Core Values and Excellence Through Sports, Skills and Talents’ for this year’s sporting activity is appropriate because this touches on the core values of the Institution. It does not end in the physical exertion done by the athletes in the competitions but it also dashes on the formation of positive attitude which is the quest for excellence in every endeavor that the students undertake”, said Media Relations Officer and CGA-OTC Commandant Captain Steven James Dino. The Dance Sport dubbed as ‘Hataw Danzport’, the Talent Show Competition and Literary Musical Contest were among the highlights of the occasion. The colorful ‘Search for MR and MS Mariners 2017 was held on September 28, 2017 at the JCJ Multi-Purpose Gymnasium. The event was culminated by a Victory Ball and the Awards Rites for the teams which excelled in the different games and contests. (Left picture) The winners in the Search for MR & Ms Mariners 2017. (Right picture) The Ms Mariners during the contest as they display their winning form. The Officers of the Corps of Midshipmen (COM) took charge of the management of the affair which was wholeheartedly supported by the student body. “I congratulate the Corp of Midshipmen, the student body and the members of the faculty & staff for the coordinative and cooperative effort in staging the Intramurals 2017 which registered an overwhelming success”, declared MPCF-Legazpi President and Chief Executive Officer Dante La. Jimenez. Legazpi City, Albay – The Mariners Polytechnic Colleges Foundation (MPCF) this city observed its 32nd Foundation Anniversary on August 4, 2017 with simple but meaningful activities, recalling its humble beginnings and bracing for the challenges that lie ahead. (Left picture) President/CEO Dante La. Jimenez addresses the academic community and guests at the Traditional Luncheon. (Right picture) The President in an interview with local radio and television stations during the 32nd Foundation Anniversary of MPCF-Legazpi. (Left picture) The Chairman of Chinese General Hospital - RADM James Dy (seated, center) signs the Memorandum of Agreement (MOA) on the grant of health benefits to school personnel with Mariners Polytechnic Colleges Foundation represented by Commodore Dante La. Jimenez. The event was witnessed by school and hospital officials. (Right picture) The President/CEO is joined by officials from sister Mariners schools in Naga City and the MPCF in Camarines Sur. The theme ‘Onwards Through Challenges with Resolve and Resilience’ adopted for this year’s event is appropriate inasmuch as the Institution has faced unrelenting tests in the past in which it has survived. These challenges are still present and the theme will continue to be the guiding light for the academic community. Included in the highlight of activities were the Foot Parade at 6:30 a.m. from the Legazpi Port Area to the school campus, the Thanksgiving Mass, the Blessing of Training Modules at the Engineering II Building, the Arrival Honors for MPCF Legazpi’s President/CEO Commodore Dante La. Jimemez, and guests City Mayor Noel E. Rosal and Chinese General Hospital Chairman - RADM James D. Dy, PCGA, the Band and Majorrettes Exhibition, the Traditional Luncheon and the Basketball Game Exhibition. The President, in an interview with ABS-CBN and Veritas Radio & TV in Legazpi City reiterated his appreciation and gratitude to the members of the Mariners academic community, the students and parents, the Bicolanos and the public in general for the support to and acceptance of the Institution which has served the Bicol Region for more than three decades. “The school has leveled to world-class standards as we assure everyone of its sustainability as required by the International Maritime Organization (IMO), the European Maritime Safety Agency (EMSA), the Maritime Industry Authority (MARINA) and the Commission on Higher Education (CHEd). This level of standard will continue to be pursued to guarantee academic quality to the Bicolano youth who avail of the education offered by this Institution”, declared President Jimenez. Meanwhile, the student, faculty and staff of MPCF-Legazpi are one as they vowed to support the advocacies launched by the administration at the 32nd Foundation Anniversary which coincided with the birthday of Commodore Dante Jimenez. Legazpi City, Albay - The Mariners Polytechnic Colleges Foundation (MPCF) this province, has featured ‘Shipboard Training’ as its main topic in the August 11, 2016 edition of the program. This was given focus by the show for the school to be able to disseminate to the audience the relevance of this phase of academic training of students taking up maritime and hospitality management courses. The guest-discussants on the topic ‘Shipboard Training’ at the MPCF-Legazpi’s radio-tv program ‘Buhay Marinero’. (Left to right) Work and Travel U.S.A. Coordinator Mr. Jefferson Bola, Maritime Studies Dean - Captain Job Espares, Shipboard Training Coordinator Mr. Webster Toledo and program Co-Anchor - Media Relations Officer Steven James Dino (back to camera). MPCF-Legazpi Dean of Maritime Studies Captain Job Espares gave pointers to would-be- apprentices who would soon be aboard sea-vessels to practice the virtue of perseverance and patience as these are among the qualities of successful Seafarers. Meantine, Shipboard Training coordinator for Hospitality Management (HM) courses - Mr. Webster Toledo conveyed the information that the academic requirement to go on-board passenger and cruise ships is a must for those taking-up these courses because it does not only give them the actual experience in working aboard ships but this also opens the opportunity for them to work with these shipping companies after they graduate. On the other hand, Work and Travel U.S.A. Program Coordinator Mr. Jefferson Bola has made a litany of the advantages which students get once they join the program for their learning and earning experience. Among them is the practice of being in a foreign land and serving and mingling with customers of diverse nationalities and people coming from different countries of the world. The guests and program anchor in a relaxed mood before the start of the program at the studios of Veritas Radio-TV. The school administration will continue to make the Shipboard Training scheme part of the curriculum not only for students taking-up the baccalaureate maritime studies but in the Hospitality Management courses. Visit MPTC website at marinerstraining.com.ph.